Brochure publiée à Chicago par le United Workers Party, éphémère scission du Parti prolétarien de John Keracher. Paul Mattick a collaboré avec ce groupe et MIA range ce document dans les archives Mattick. Pamphlet published in Chicago by the United Workers Party, short-lived split from the Proletarian Party of John Keracher. World-wide Fascism or World Revolution? Manifesto and Program of the United Workers Party of America. In a period of world-wide crisis constantly deepening; during a process of general and absolute pauperization of the working-class thru-out the world; in the face of the imperialistic tendencies towards a new world scale butchery; with the sight of the march of fascism covering the globe before us; in spite of the temporary triumph of the capitalist forces on the grave of a once powerful international labor movement, after the most serious defeat of international Communism, the UNITED WORKERS PARTY OF AMERICA presents this small pamphlet to all serious revolutionists, to help them and us to better understand our real situation, and to clear up to some extend the present ideological confusion in which the working class finds itself. The dialectic movement of the world makes every problem an historical problem. It also changes in its course the role of organizations and ideas. What once was revolutionary becomes with general development, reactionary. Organizations, tactics and ideologies that were once the expression of progressive development of the proletarian struggle against capitalism, in time and in the course of that struggle become obstacles in the path of further development. What was once revolutionary, in spite of the fact that it is has now become reactionary, lives on as a Tradition in its original content and form, and hinders the development of the new and the real revolutionary forces. This is why it is necessary that the weapon of criticism becomes the criticism of the weapons. The Party and its Program is but the expression of the role that revolutionary consciousness plays in history. It is a part of history, not history itself. A Program alone is of no value unless it is followed up by action on the part of the working class. If it is practical, if it is realistic, then it becomes a force which in combination with the revolutionary forces created by the objective conditions brought about by capitalist development itself, may be able to shorten the birth-throes of the new society. It is our opinion that we are not at the end but at the beginning of the general crisis of world capitalism; and parallel to this objective situation, we are not at the end but at the beginning of a real revolutionary labor movement, which must and will develop on an entirely new principle and tactical basis. Beginnings are always difficult and every revolutionary voice is first a voice in the desert, but we are convinced that sooner or later reality itself will move toward the advanced thought and what seems today still an abstraction will become the actual practice of the fighting proletariat. Traditions must be broken down to bring about unity between theory and practice. Revolution is only possible when this unity becomes an actuality. The purpose of this pamphlet is to help the revolutionary movement come closer to this situation. THE UNITED WORKERS PARTY OF AMERICA. World Wide Fascism or World Revolution? THE PERIOD of GENERAL CRISIS for CAPITALISM. Five years of crisis on a world-wide scale have passed. All tendencies are pointing to a further deepening of the international crisis. Industrial world production is below the scale of 1914 and is decreasing. The unemployed army, although it has already one-half of the industrial world proletariat in its ranks, increases still further. The economic-political chaos forces everything in its deadly downward trend. The theories of the economists of the ruling class become more ridiculous, and the illusions of the petite-bourgeoisie change to a deadly fear. From an advancing element, Capitalism has become a restricting one. Its movement toward collapse is a situation of catastrophes which bring to the human race increasing misery and suffering on a larger scale than in any previous crisis. Traditions hinder the workers from grasping the fact that the present depression cannot be overcome within the capitalistic boundaries. The hope which the ruling-class has planted in the heads of the workers, that a new boom-period will come, has not vanished although it is becoming ever more difficult to defend the system as illustrated by its daily practice. Capitalism has surpassed many crisis and depressions during its development. Each of these crises was but a step for further progressive development which made the basis for a new crisis on a higher plane; but each depression period was followed by an upswing, a boom. All other depressions were overcome, so why not this one also? The world-wide extent and the depth of the present crisis may explain its intensity and its length, but it cannot prove the permanency of its character. It is necessary that the working-class should understand that the present crisis is permanent for capitalism. The analysis of the present situation must take into consideration the fact that we are living in a new historical period; a period of positive decline for the capitalist order. On the position that the labor movement takes in relation to the crisis and the final collapse of capitalism, will the real character of the movement be shown. If it fails to explain, on the basis of the laws of motion of present society, the tendencies of the present system, then it will fail in its task. The Historic Extent of Capitalistic Development. The capitalist process of reproduction repeats itself, not in the form of circle, but as a spiral narrowing to a point. Capitalist production must, due to its inherent contradictions, lead to its own negation; but only the accumulation of these contradictions can transform them into something different; into revolution. According to Marx, the development of the productive forces of society is the motive power of historical development. When the productive forces increase, then productive relations also must change so as not to become contradictory to this development. Capitalism as an economic system had the historical mission of developing the productive forces of society to a much greater extent than was possible under any previous system. The race for profit under capitalism is the motive force in the development of the productive forces. For this reason then, this process of development can continue only as long as it is profitable. There is no economic collapse as long as the profit made, satisfies the wants of a progressive accumulation. When accumulation can no longer be resumed, as in the present crisis, then capitalism has reached its historic extent. It then goes into the stage of decline. It is only in this period that a REAL revolutionary movement of the workers becomes possible. Marx always considers the economic laws of motion from two points of view; first, as “a process of natural history”; second, in its specific, social, historical forms. The development of productive forces went on in every social system; a process consisting in an ever increasing productivity of labor, due to better working tools and methods. The productive process has in a capitalistic system besides its natural, general content, which it shares will all other economic system, also the form of being a process producing values and surplus value. Due to that feature, capitalism has been able to accelerate the development of the productive forces so tremendously. The productive forces are not only machines, raw materials and labor power, but also capital. Their development means the expanding of production and reproduction of capital, and this is only possible when surplus value or profit is the result of the production process. By analysis of the process of producing surplus value, Marx finds the tendency of a conflict between the material productive forces and their capitalistic integument. When insufficient surplus value results from production, there is no possibility of continuing the development of the productive forces. The capitalistic forms must then burst asunder to make place for a higher, more advanced, economic and social system. The Accumulation Process of Capitalism. The general progressive development of man-kind is expressed in all forms of societies by the development of the means and methods of production. This results in an increase in the productivity of labor, of the mass of products by a decrease in the actual exercised labor-power. In Capitalism this expresses itself by more and more capital being invested in means of production and less and less for labor. It is true of course that when Capitalism is on the upswing, then as there is invested more and more capital in the means of production, the amount of capital invested in labor-power increases also, but slower than the first. On a high spot of the capitalistic development the number of workers employed in relation to the total capital does not only decrease relatively but also absolutely. Since the exploitation of workers is the only source of profits this already indicates that the profits of the capitalist must decrease with an increasing accumulation. The increase of the organic composition of capital is accompanied by a falling rate of profit. This falling rate of profit alone is of no danger to capitalism as long as it has the possibility of accumulating faster than the rate of profit sinks. This is made possible by an increase in exploitation as well as with the expansion of the fields of capitalistic production. But even if the increase in the mass of profit compensates for the fall in the rate of profit, or even exceeds the later, the mass of profit grows slower than the amount of profit which is needed to satisfy the ever increasing needs of accumulation. The fall in rate of profit is an index to the relative fall in the mass of profit which in a higher stage of accumulation becomes an absolute fall. If accumulation is to continue, more and more of the surplus-value produced by the workers must be used for the development of the productive apparatus; decreasing by this, the parts intended for additional labor and for the consumption of the capitalists. Eventually this process has to come close to a point where all of the surplus-value is needed if a sufficient accumulation should be made possible. At this point the capitalist are forced to increase the exploitation of the workers tremendously so as to make possible some profit to compensate for this development. The class struggle sharpens. If the amount of surplus-value produced should not be sufficient for the needs of the accumulation process, despite the most intense exploitation, then the process of accumulation stops and Crisis results. A standstill in the accumulation process leads to a general crisis affecting all spheres of production. The capital which is too small to be profitably reinvested now becomes in actuality a surplus of capital. The growth of Capital has been faster than growth of possibilities for profitable expansion. Over-accumulation is the result; which means on the one hand a surplus of capital which cannot be reinvested in profitable production and on the other a vast army of unemployed who can no longer find jobs. Only with the possibility of profit can the process of accumulation be resumed; if this possibility is excluded, then the crisis of necessity becomes permanent in character. A permanent crisis means for Capitalism, collapse. The Collapse of Capitalism and its Counter-tendencies. Marx’s theory of accumulation is the law of capitalist collapse. The tendency of collapse is expressed in the crisis and is overcome in the crisis. If crisis are an expression of collapse, then the final collapse is nothing but a crisis unhampered by countertendencies. Counter-tendencies are in the main, try-outs to re-establish expansion of capital on a profitable basis by reorganizing of the total mechanism of production and distribution. In all previous crisis the success of these counteracting tendencies changed the depression to a new boom period. Rationalization generally, lowering of production costs, lowering of wages, lowering the income of the capitalist middle class, capital depreciations, writing off of capital, devaluation of capital, securing extra surplus-value by imperialistic expansion, imperialistic movements to get cheaper raw materials, improving the relation to markets domestically and on the world market, and many other factors act as tendencies to aid Capitalism overcome crisis. The tendencies against the collapse of Capitalism however, are like everything else, also of an historical nature. In the course of development they lose their power or are overcome entirely. At a certain point in capitalistic development intensifying the productivity of labor does not increase but decreases profits. The pauperization of the working-class has its absolute limits. Capitalist expansion on a world-scale reaches its limits before it reaches the natural borders of the world. There is an absolute limit to which capitalist production can be expanded and developed. The tendencies which have successfully operated to help Capitalism out of previous crisis have failed in the present depression. They no longer exist as countertendencies or they are too weak in relation to the depth of the present crisis of international Capitalism. The conclusion that this crisis is permanent and that we are in the dying stage of the Capitalist system depends on the analysis of the counteracting tendencies. If there are any possibilities for restoring profits, further accumulation, further expansion, then these must be considered. Monopoly Capitalism and the Vanishing Counter-tendencies. Monopoly Capital in a depression, restricts production by closing some of its enterprises. If a larger demand sets in, it satisfies this by reopening the necessary plants or factories. The big reserve of productive capacities in Monopoly Capitalism does not necessitate new and big investments for fixed capital. In this sense it restricts also technical progress. At a higher stage it restricts the development of the markets for means of production instead of developing them. The possibility of a technical revolution which would lead to the moral depreciation of large masses of capital can no longer be expected because the restriction of the productive power has become a “life necessity” for monopoly capitalism. This is true even though it indicates a process of collapse for the system. Capitalism now lives by dying. In previous crisis the devaluation of capital has been an important factor toward recovery. It has lowered the organic composition of capital and by this made the total capital smaller so that profits became relatively higher. In previous crisis too, after the mass bankruptcies had forced out great numbers of capitalist enterprises, the ones who survived were forced by competition in a period of dropping prices to lower their production costs. New and bigger machines which could operate at a profit at the new lower price level were needed. The demand for new fixed capital increased and this demand carried with it other industries into a new boom. In the present crisis however the large amount of bankruptcies did not have a similar effect. How little a forced devaluation of capital in monopoly capitalism means becomes clear if we confront the production of monopoly capital in relation to the total social production. There are industries where 90% of the total social production is done by monopoly capital. This is especially true in the U. S. Almost the half of the total social production on an international scale, in the most important branches of production, is done by monopoly capital What result could bankruptcies of small enterprises have under this condition? The present depression has demonstrated that this counter-tendency, devaluation of capital, is about gone. Rationalization still may enrich an individual capitalist and in some instances solve their individual problems; but for society as a whole, the rationalization process in monopoly capitalism tends to make society poorer. It may still bring about a saving in wages and decrease the production costs but all that is saved is eaten up by nonproductive expenses coming form the idle capital in the form of closed enterprises and by the further restriction of the market possibilities as a result of the process itself. In the later stage of accumulation it becomes a failing rationalization; it no longer serves as a medium to overcome the crisis but tends to deepen the depression. The export of capital, which in Imperialism is one of the most powerful means for capitalist upswing and a most important factor for overcoming crisis, has decreased to almost nothing on an international scale. Imperialist competition for foreign markets became ever more sharp as a consequence. The tendencies toward war on a world proportion continues as a constant menace. The present crisis is distinguished from all previous ones by the fact that the counteracting tendencies are either not present or are too weak to operate successfully and restore profits to a point where further expansion is possible, where idle capital can be put to work and the process of capital accumulation again be resumed. The decrease in the total surplus value intensifies the struggle between the different capitalist groups for their portion of the surplus value. The political maneuvers of the different interests mirror this economic situation. The severity of the present crisis for example, makes it impossible for industrial capital to pay obligations to bank capital or to even pay the interests on this money. Industrial bankruptcies are followed by bankruptcies of banking capital. Inflation and similar measures are taken to liquidate these debts and the cost of this liquidation is foisted onto bank capital, the middle classes and the working class. In its struggle to increase its available profits capitalism is forced to make heavy onslaughts against the petite-bourgeoisie to eliminate as much of the profit consuming middle stratas as possible. The growth of the middle class goes slower then the process of their proletarianization. The total elimination of the middle class however is impossible in capitalism because in order to assure its own existence capitalism needs the middle class. With the death crisis of monopoly capitalism the chronic agrarian -crisis deepens. The disproportion between the industrial prices and the prices of the agrarian products has forces the farmers in many countries of the world into open rebellion. Reluctantly capitalism is compelled to make concessions to the agrarian population in the form of tariff reforms, loans and credit by the state, stabilizing of prices, direct relief in exchange for a decrease in production, etc. These concessions however are usually made at the expense of the workers. The process of pauperization of the working class develops concomitant with the development of Capitalism. On the upswing of capitalism it acts as a relative pauperization but in the death crisis this changes to absolute pauperization. Wage cuts and general worsening of the conditions of the proletariat results in mass misery. To prevent social unrest the capitalists are forced to dispense relief. They are also forced to strengthen their “power of coercion” the repressive power of the state to prevent uprisings. The maintenance of the state becomes more and more expensive. In contradiction to the necessity of increasing profits for Capitalism, there is a decrease in available profits and with it an increase in the cost for unproductive things. As the crisis deepens the possibilities for even partial recovery diminish and capitalistic collapse as a tendency becomes more and more active. Political collapse as a tendency follows but here are also counter-tendencies which must be considered. The hope that capitalism will overcome its present crisis, presupposes the other hope that it is possible to develop a higher economical form than monopoly capitalism. This hope is impossible within the framework of private property. “State Capitalism” is in an economic sense not a higher from than monopoly capitalism, but only a new face for the latter. It is a political measure to counteract the political dangers accompanying the class-shiftings in the last phase of capitalism. The political basis of the ruling class becomes too small at this stage, and it has to engage state power in the interest of monopoly capitalism more directly. The shortage of profits and the impossibility of overcoming the depression, leads to intensification of the struggle for the division of surplus value. The social-political relations in capitalism become very unstable. The struggle between financial, industrial and agrarian interests intensifies the fight for the control of government. This struggle is but a political reflex of the deepening world-crisis. In spite of many possible modifications, the strongest capitalist group, Monopoly Capital, will finally control the situations. The Struggle of the Middle Strata. The middle class which lives directly or indirectly on surplus-value, have no economic or political common cause with the proletariat, although they often try to engage the workers for their special cause. Their hope and their struggle is to promote themselves from their petite position into the position of a real bourgeois. This is only possible when capitalism functions; and chances are better when it functions well. The actual pauperization of the middle class as a rule does not at first change their attitude against the working-class, but only sharpens their struggle to escape a proletarian status. They become, not less, but more, capitalistically inclined. As long as their hopes can be retained, they remain the allies of the ruling class, and with them, the strongest force against proletarian revolution. The farmers generally, with the exception of those whom by the industrialization of their farm enterprises already regard themselves as capitalists, have different interests from the industrial and financial capitalists. Development is partially based on the destruction of the old style farm. It is to the interests of capital to hold the profits of the farmers as small as possible, to assure themselves bigger profits. To cut wages in industry, it is necessary to have cheap prices for farm products. The technical backwardness of the agrarian production has allowed the farmers certain privileges as their profits were not in-calculated in the average rate of profit. The elimination of the farmers profit, means the easing of the burden of the depression for the capitalist. By the use of more and more fixed capital in agriculture, this privilege of the farmers is being eliminated, but before the whole of agriculture is really industrialized, it has still a long way to go. In the meantime, the struggle between the farmer and the capitalist will never cease, and this struggle is only another expression of the growing socialization of labor. The increasing specialization of agrarian production enables capital also move and more to control prices and profits of the farmers. The farmer does not fight against Capitalism, but for their “interests” inside of Capitalism. The farmers defend their private property which is endangered by the expropriation process of monopoly capital. The struggle will continue as long as capitalism lasts. In the struggle one part of the farmers will be played against the other part. A situation of energetic struggle for existence results, each striving to avoid elimination. The farmers become more radical and also more rebellious, but in a reactionary sense. The struggle of the farmers for their private property does not bring them closer to the workers, but makes them more of an enemy of the working-class. The policy of the farm movement sometimes looks very friendly to the workers hoping for their support. Actually they are interested in high wages for the industrial workers, because they are interested in high prices for their products which goes into the consumption of the industrial working class. This attitude, however, changes at once into a bitter fight against the working class when it becomes a question of communism or capitalism. Communism is no solution for the farmers, as communism expropriates their private property and makes it social property. In communism this is a radical act. The expropriation process which goes on in monopoly capitalism is a gradual one and involves only a small fraction of the farmers at a time. The fronts of the class struggle in monopoly capitalism become clearer than they ever were before. On the one side, they have something to lose, even if this may only be their hopes; but on the other side, they have nothing to lose, not even hopes. In the upswing of capitalism, the concentration and centralization process expressed itself in the continuation of accumulation of the total capital. Now in the decline period of capitalism, this same process is carried on only by the elimination of the weaker capitalists, and by the restriction of and the lowering of the living standards of the middle class and farmers, and the general and absolute pauperization of the workers. The tendency toward State Capitalism is the political expression of this process in the stagnation period of monopoly capitalism. Economic concentration necessitates also more political concentration into the hands of the ruling capitalist group. The tendencies of “State Capitalism” are closely related to the capitalist tendencies towards a more “planned economy.” Attempts are made to copy the Russian example, disregarding the difference in the economic development in the various countries. This is especially true of fascist nations and those who are leaning toward fascism. An intensive propaganda for planned economy which will do away with disproportion in the different fields of production, eliminate competition, regulate wages, labor time, and prices of commodities by the state, is carried on. Even the control of profits is taken into consideration. Capitalist “planned economy” is an impossibility because the system can only develop and function as long as it is anarchistic. Under capital relation a planned economy would presuppose a static capitalism and a stationary capitalism means a permanent crisis. Even if these theories of planned economy were applied they would be done away with at once as a new boom would set in. A new boom period is only possible with accumulation being resumed. This means impetus to capitalist production not restriction, it means increase not decrease in capitalistic anarchy. The experiments in “planned economy” tried in the U. S., Italy, and Germany have proofed that this process is only supposed to serve the interests of monopoly capital. They take the form of, forced trustification, organizing of cartels, state credits, wage agreements on the basis of spread the general misery, exploitation of cheap labor of the unemployed, lowering the cost of unemployed relief, etc. All of these things help ; none of them hurt the interests of Capitalism, but they do not solve the crisis. The New Deal program of the Roosevelt regime was nothing other than the new conception of the monopoly movement of American capital in the permanent crisis. Its only value for capitalism as a whole was the strengthening of the capitalistic ideology. The means to accomplish this were very simple ones. Roosevelt borrowed from the American Labor Movement, which is still following the conceptions of liberalism, the slogans of reforms. These slogans and ideas were formulated to solve the disproportion in the different fields of production; to do away with unfair competition; to promote higher wages(? ); a shorter work day; higher prices. ; a better banking system and other phrases that at times became even sensational. In contrast to the slogans and propaganda of the New Deal, its practice was entirely different. Every one of its attempts failed. Every one of these ideas proved bankrupt. No recovery was attained. No expansion of production set in; industrial credits did not increase and the unemployment figures were not affected. The farm projects remained only as demonstrations of the insanity of the system by its destruction of farm products and its restrictions of production; but in no way did this lift the burden of the farmer. The elimination of “unfair competition” was only directed against the competing sweat-shops of small capitalists, and at that was a means for the further concentration of capital which led to a deepening of the general crisis. The result of shortening the work-day was negated by further rationalization, and did not effect the unemployed situation. All the beautiful theories failed as a means to overcome the depression. It is true that the C. W. A. gave temporary employment to a large number of the unemployed, which resulted in turn with a slight boom in certain industries; but the statistics prove that the sum of the total wages did not increase, but in actuality decreased. Prices for consumption goods which the workers need grow faster than the wages. With the New Deal the workers, as a class, received less of the total social product than they did before. The Roosevelt policy only increased the tempo of the general pauperization process. It resulted only in a more planned distribution of misery for the working class. Even granting much success in the elimination of competition, the Over-accumulation of Capital is still working and leads to capitalist collapse. The decrease in profits in the general crisis, intensifies the class struggle. The political, as well as the economic struggle, becomes sharper. Due to the concentration process, the political basis to rule for capitalism becomes too small. It becomes necessary for the capitalists to strengthen their political forces by engaging the middle class and the farmers to their support. The old democratic methods are not longer satisfactory; they must be exchanged for snappier and more direct methods. A government is no longer sufficient; what is needed is a dictatorship. The ferment and social unrest in the last stage of capitalism must be suppressed and controlled that the system may survive. Social consciousness is in capitalism an ideology like in all other class societies. The purpose of this ideology is to hide the real character of capitalism; to hide the different class interests and the class struggle. In capitalist reality, no common interests exist. It has to fake, by way of ideology, an appearance of common interest to enable a social practice. The needs of capitalism are identified as the needs of the whole human race. With the sharpening of the actual class struggle, and. the growing contradiction between ideology and reality, it becomes more and more difficult to uphold the sham of class collaboration as being the interests of all classes. It becomes necessary to fight the idea of class struggle more ruthlessly. Capital by way of its middle-class spokesman becomes “social”; it no longer ignores the class struggle but it makes the class struggle responsible for all capitalist difficulties. The class struggle is not a result of the crisis; but now, for capitalism, the crisis is the result of the class struggle. The idea of the class struggle is given as an invention, brought by Marxian criminals into the world. It is dangerous, not only for capital, but for the whole of society. Real “socialism” makes the abolishment of the class struggle necessary. The class struggle is not done away with by the elimination of the classes, but by the destruction of the Marxist class struggle “idea.” The middle classes, who prefer to remain as a middle class rather than to become proletarians, take to this idea, and by this are brought into a front with monopoly capital against the workers. The labor-movement has pointed out what distinguishes the classes; now capitalism points to what unites the classes. Ultra-nationalism also becomes a large part of the capitalist ideology, so Fascism becomes “national-socialistic.” The nation is set against the rest of the world, or against special enemies. A “third” factor, not the class system, is responsible for all the misery in which the people find themselves in a particular country. The propaganda for imperialistic adventures is strengthened by this immensely. Fascism, however, is not necessarily bound to a specific ideology. It may vary with the peculiarities, the history, the degree of development, and other special things in the different countries. The essential thing, however, is the same everywhere. It is developed in order to preserve the existing social order. The desires of the middle class were better fulfilled in the past than at present. This makes of the Fascist ideology a reactionary one. “Back to the good old times” is the cry of fascism in Europe; “back to the days of the frontier” is the cry in America, but it is reactionary only as an ideology. In reality, it satisfies the further concentration process of capitalism and saves profits for the ruling class. The fact that fascism exists in the lesser developed countries, also, does not alter the conclusion that it is a form of government under monopoly capitalism. Czarism for example is only distinguished from the German fascism by the fact that in the first case a feudal regime tried to hold power; and in the second, a capitalist regime fights to remain in control of society. Fascism in the general crisis is a situation of capitalist barbarism. Killing becomes a political science; robbery goes on as economy. Pauperization of the workers, as the only source for making possible profits, makes a passive proletariat necessary. To accomplish this, enough privileges must be given the killers. The rebellion of the middle class is essentially not directed against capitalism, but against their own pauperization. Fascism makes use of all the energies of the middle class, and engages them in the interests of capitalism against the only revolutionary class – the proletariat. In America, with the breakdown of the New Deal, it is considered a likelihood that the Roosevelt regime will become a fascist dictatorship; but this conclusion is not necessarily correct. Fascism is the best form of government in the permanent crisis for monopoly capital; but it is not an absolute necessity. A dictatorship of the capitalist class, themselves, is possible here where the middle class are relatively weak. Only when a condition exists where the workers are in a menacing condition, when the middle class becomes rebellious, when a really revolutionary situation lies before capitalism, then the ruling class will be forced to further the fascist tendencies. The new fascist organizations which are being organized in America, and which try to copy the Hitler movement, are not the essential fascist forces; but are merely private enterprises of small politicians. The real fascist reserves are in the older organizations, such as the American Legion and the American Federation of Labor, which have always been the expression of every reactionary force of the middle class and the labor aristocracy. These organizations are not yet fascist because the class struggle has not yet developed to a point where it will be necessary for American capitalism to engage its last reserves. When the middle class become more pauperized than at present, the fascist movement will grow faster in the United States than anywhere else; in fact as the situation stands now in America, fascism has more chance to develop than the revolutionary movement of the workers. The old labor movement dies with capitalism. This enables fascism. even to draw many workers into their ranks. From social reform, the development leads to social fascism. In spite of this development, however, to escape their misery, nothing else is possible for the working class than to overthrow fascism and the capitalist system. The death crisis is in this respect different from all previous crisis, in that, even if a part of the capitalist class should overcome the depression from the viewpoint of their profits, for the workers the continuation of capitalism means only the constantly worsening of their conditions. The portion the workers get from the social product will be always smaller; starvation and death are the only perspectives under capitalism for the workers. The international character of the depression, the international character of the class struggle, will force the dictatorship of the ruing class all over the world. Fascism becomes a world menace. To escape this situation, nothing else is possible but that the workers overthrow capitalism with the world revolution. History has set the stage; – World Fascism or World Revolution – Barbarism or Communism. The economic analysis has shown that the objective situation for social revolution is present. The political situation however is different. In a relative sense the international bourgeoisie was politically never stronger despite their chaotic economic status. The revolutionary working-class movement has suffered one defeat after another culminating with the annihilation of the German movement which was the key to the world revolution. These defeats can be attributed not alone to the unreadiness of the movement, but also to the fact that the workers failed to grasp the significance of the permanent crisis and that the movement did not rid itself of the methods and traditions of the old labor movement which are obstacles to the revolution. The old labor movement had its beginning and development during the upswing period of Capitalism, a period in which the pauperization process of the workers only occurred in a relative manner. The Marxian theory that with the accumulation of capital the accumulation of misery of the workers went hand in hand, was for the superficial onlooker defeated. Apparently as the productivity increased, so too, the living standard of the workers became better. The fact that in relation to what they produced the workers were getting less and less – that the workers were getting a smaller and smaller part of the social product was ignored. The trade-union and social-reform-parliamentary organizations grew and even the political influence of the workers seemed to increase. An opportunistic policy wherein the workers gained reforms by aligning themselves with capitalistic groups against other capitalistic groups, thus taking advantage of the divisions amongst the capitalists, showed nothing but the backwardness of the class struggle. This was the basis of the old labor movement in a period when only reforms were possible. Even the labor movement could only have a capitalist policy. The struggle between capital and labor was for a greater share of the social product – a struggle on the basis of, and inside the framework of capitalist society. The theory of economic collapse and the principle of revolution was easily lost and in its place grew the ideal of “peacefully growing into socialism” The interests of the labor movement was made identical with the interests of society as a whole, and so in consequence with the interests of the capitalists. For reformism the cause of crisis was the insufficiency of capitalistic organization. The problem was not in capitalist production but n circulation of commodities and in competition. This would be solved by the concentration of capital and by education of the workers to the extent where they would acquire legalistic political power enough to bring socialism about by legislation. The revolutionary struggle was thrown overboard and these capitalistic policies took their place to the degree that the movement became only a tool in the control of capitalism. From Social Reform to Social Fascism. With the advent of the World War the pre-war old labor movement which was combined in the Second International, dropped all Socialist phrases and turned to defend the capitalists in the various countries. They proved that their reactionary form was but a cloak for their reactionary content. They also showed in the revolutionary period at the end of the war, that these organizations which were built up to fight for reforms inside of Capitalism, could not take advantage of a revolutionary situation. In the thunder of the Russian and Middle European revolutionary uprisings the new labor movement was born. A revolutionary movement in a revolutionary period. The goal was the overthrow of the capitalist system. The means, were the new organizations of the workers,- the committees of action, the workers’ councils, the Soviets. Once more the old labor movement was able to serve Capitalism. It defeated the young revolutionary movement with the slaughter of many thousands of revolutionary workers in Germany, and by taking the control out of the hands of the workers’ Soviets in Russia and instituting the dictatorship of the Bolshevik Party over the workers. With new names, new slogans, and new leaders, the Third International became the center of the newly organized remnants of the old labor move ment. A new appearance, but the same old social democratic content. Thus started a new period of trade-unionist horse-trade and parliamentary fakery in which the working-class has gone from one defeat to another. To understand the Third International, the Bolshevik movement with its various oppositions, such as the Neo-bolsheviks of the “Fourth International,” a review of the Russian development is necessary. The industrial workers who took the lead and fought in the Russian revolution, fought in the interest of communism. The peasants, however, who were the vast majority and the real force of the revolution, did not go beyond the new distribution of soil. Their principle urge was a revolt against Feudal conditions to bring about the possibilities of development of capitalistic agrarian technique. They have been continuously a determining factor in the development of Russia since 1917. The backward economic character of the country did not allow the building up of a socialist society. The only policy possible under these conditions was to make whatever concessions were necessary, in order to hold power. This policy of making concessions on both a national and international scale has developed to a point where it is now directed against the interests of the industrial world proletariat and the world revolution. It is true that this policy of concessions was to be adopted only temporarily, and would be abolished as soon as the world revolution would spread over Europe; but with the defeat of the German workers in 1919, and again in 1923,–the hope of a continuing world revolution was given up. The main object now became one of holding and strengthening the power of the Bolshevik Party in Russia. The Russian Communist Party being the largest in the Third International became the dominating section. The location of the International at Moscow strengthened this tendency. With the national and international interests of Russia as a determining influence, the Third International proceeded to build up mass parties in the various countries to support the Russian development. The different section of the Communist movement were forced to adopt reformistic and opportunistic policies to compete with the parties of the Second International in order to control and use large portions of the working-class. Defense of the Soviet Union became the first principle of all the Communist parties of the Third International. The world revolution of the proletariat was pushed aside, and the first duty now of communists everywhere was the support of the Bolshevik regime and “building socialism in Russia.” Any critic against this policy was immediately cast out. The tradition of Bolshevik success of 1917 covered up their counter-revolution practice. The breathing-spell which was to safeguard the Bolshevik regime led to the growth of a strong bureaucracy. The “Dictatorship of the workers” became a dictatorship of the bureaucracy over the workers. They identified their interests with the interests of the Russian workers, and even with those of the international working-class. All the expediencies which they have found necessary have been done “in the interest of the world revolution.” Trade alliances, military alliances with capitalist countries, world peace in order to carry on the industrialization process and to prepare for imperialistic action, killing off of all real revolutionary movements in the name of communism, building up a new system of exploitation of workers under the name of “state communism,” sums up the present policy of the bureaucracy and of its tool – the Communist International. The principle activity of the various sections of the Third International has become one of propaganda on behalf of Russia. By portraying the wonderful progress made in the “Worker’s Fatherland,” the workers of other countries are to be convinced that to follow the example of the Russian workers is their solution. Here again, as with the Second International, the revolutionary process becomes one of propaganda alone. Some day the workers will be convinced, and as a result of their consciousness they will act. Those who can advertise the best will succeed. This is called “Marxism” and Leninism. Lenin’s goal: “The worker’s state” or “state capitalism under the control of the workers” (which is after all a Utopia) has really led to the development of a state capitalism which controls the workers. All socialist tendencies are being killed, while the capitalist tendencies are becoming stronger. In the prevailing ideology, which is necessary to cover up the realities, it is described as “state communism” and “building socialism.” The economic basis, however, is the exploitation of workers. In place of the old Capitalistic and Feudal exploiters, new ones – the organized bureaucracy – are in control. This bureaucracy, not the workers, have control over the means of production and consequently control over the products as well. With this the exploitation of the workers is guaranteed. It is explained that although exploitation now goes on, it will at a later stage of development, be returned to the workers in the form of social benefits and increasing wages. The practice of state communism has proven, however, that with its development the workers are not less but more exploited. It is true that they can show that the wages of workers have increased, but they have not increased as fast as productivity. Here we have the relative pauperization process of the workers which in a later stage of development becomes absolute pauperization. In pointing out that there is no unemployment, it proves nothing but the fact that the industrial development has not been able to convert the peasantry into industrial wage-workers as fast as is required by present day technique. At a later stage of industrialization, unemployment must of necessity develop just as in other capitalistic countries. The wage and capital relation of Russian production, the production of exchange values, the control over the means of production by the bureaucracy and not by the workers, excludes any development towards communism in Russia. This new system of exploitation develops a new ruling class, which is just as much an enemy to the proletarian revolution, as were the capitalists before. A new proletarian revolution becomes the perspective of the Russian workers. The capital relation in production is bound to result in increasing misery for the workers, in crisis and ultimate collapse. The policy of the Third International of converting the character of the communist movement into a defense corps for Russia diverts these organized workers from the actual class struggle, and the real struggle for proletarian revolution and communism. Traditions from the past always hinder the real development of the present. The workers continue to fight in the class struggle in the same manner they fought in the past. In spite of the fact that both the Internationals have collapsed as revolutionary organizations, the ideology of these organizations still exist and hinder the development of real revolutionary consciousness. In the countries where the labor movement has been destroyed, the workers build up again on the old principles and in the old forms which they had before. The opposition groups who severely criticize the Third International for its opportunism and its contradictions try to build a Neo-Bolshevist movement. The criticism they offer, however, is purely on the basis of tactics. The incorrect tactics of the Communist International and its various sections result because of the poor leadership. The question becomes one of good or bad leadership, a position based on pure speculation because no one can tell how long leaders will continue to be good, or how soon they will become bad. The competitive struggle between leaders and bureaucracies in the movement characterizes the struggle between the Communist International and its oppositions. In their fight they try to elevate the struggle between political factions to world history. The whole program of the Neo-Bolsheviks of the “Fourth International” groups can be summed up in their slogan, “Back to Lenin.” As far as Lenin is concerned, he did nothing more nor less than to propose the Marxian demand for the dictatorship of the proletariat in a backward country in a modified form. The modification of this demand, from the dictatorship of the workers to the dictatorship of the party resulted from the backwardness of the country. The Bolshevik success of 1917 is an historical one. The success of their policy at that time does not assure success in another country in another historical period. “Back to Lenin” is in reality a meaningless, stupid phrase. A distinction between Leninism and Stalinism is not possible, as the latter is but the outcome of the former. It is not merely a defeat of Stalinism that confronts the world movement, but the whole Bolshevik period which started with Lenin has found its historical end. The question today has become Bolshevism or Communism. For the Bolshevist movement as well as for the Reformist movement of the Second International, the development of class consciousness was determined by the development of the Party. Without the right Party, without the right tactics and right leadership, the workers were helpless. The workers may fight, but their struggles could not be successful without the right party in the lead. So the Party becomes the determining thing. The correct party is the one with the most correct program and tactic. The correct tactic depends upon the correct leadership, and so in the last analysis, history again becomes the work of great men. The struggle of the competing bureaucracies in the movement manifests itself in the attempts of building up mass organizations. With this objective, their approach to the trade union movement becomes one of trying to win workers by working within the trade unions, or shows itself in attempts at capturing control of the unions. An analysis of the trade union movement is necessary. The success of the trade unions depends on the condition wherein a section of the workers better themselves at the expense of the rest of the working class. It presupposes a division of the workers into the organized minority and the unorganized majority. It can at no time represent the interests of the working class. It can only function in capitalism, and the more stable capitalism is, the better it can function. Its function centers about the fight of the organized section of the workers for reforms in the struggle against the relative pauperization process in the upswing period of capitalism. In the permanent crisis when the pauperization process becomes absolute, the trade union movement loses all possibility to function even in the interest of the organized section. Worse, they become not only passive in the struggles between capital and labor, but actually reactionary to the extent that they operate to defeat all real struggles of the workers against the encroachment of capital on their living standard. Because of the tendency toward spontaneous strikes, and the possibility that the bureaucratic leadership of the trade union movement may lose control of the workers in the last stage of capitalism, it even loses its value for the capitalist class. As a result, it changes to a “bulwark against revolution” and becomes one of the best supporters of the system. By neutralizing large sections of the workers, it is as strong a force in behalf of Fascism as the Fascist movement is by fighting for it. The “boring from within” policy to capture the unions or to revolutionize the trade unions is just as impossible as the Socialist policy of revolutionizing the capitalist government. The new communist trade unions, in countries where they had a chance to develop, turned just as reactionary as the old ones. When the capitalist crisis deepens to a dangerous stage, capitalism will destroy the trade unions or make them servile Fascist organizations operating against the workers. They can no longer allow them to function independently because of the danger that the leadership may lose their control and the workers may precipitate a struggle which would be dangerous to capitalism in such a precarious period. In the permanent crisis, the trade union movement has reached its historical end, and must be demolished as a menace to the revolutionary movement. The parliamentary-political parties are build up like the trade unions with a bureaucratic leadership at the top who control the members and the activities of the organization. The organization always functions in the interests of the bureaucracy rather than in the interests of the workers. Parliaments belong to the capitalist class, and the capitalist system. Their function is to serve as an instrument for the legal differences between the capitalist groups inside the system. It is absolutely useless as a “revolutionary Tribunal,” and in the permanent depression cannot even allow the slightest reform in favor of the workers. The use of elections as a “barometer of the ripeness of the working-class” is just another cover for parliamentary fakery a “revolutionary parliamentarism” is impossible as participation in parliamentary activity is based on compromise, and that means the workers must give up their real class interests. Parliament also serves as a means of putting illusions into the heads of the workers. The active struggle and initiative of the workers is not necessary. The leaders will get the results for them in the parliaments. In the face of growing World Fascism, it is a crime to call for the participation in parliamentary activity which distracts the workers from the real struggle to an illusionary one. In the last stage of monopoly capitalism, parliamentarism loses its value even for the capitalist class. Even as an ideology, “Democracy” cannot be tolerated. Fascist dictatorship becomes the only means of absolute control necessary to capitalism. The activity of building up the historically out-worn parliamentary political parties defeats the revolutionary movement of the working class in the fact that they thereby neglect the real class struggle and the real revolutionary movement. THE NEW REVOLUTIONARY LABOR MOVEMENT. For Reformism, as well as for Bolshevism, the development of class-consciousness means the development of the Party. The Party is the head, the brain, the director in the class struggle and of the revolution. Without a Party, and especially without a party with the right program and the right tactics, the workers are helpless. The workers may revolt, but without the leadership of the party they cannot fight successfully. The tempo of development of the party is the tempo of the revolution itself. Correct slogans, correct tactics are important and the leadership is the most important of all. The initiative of the masses is killed; discipline to the party-line is what counts. The influence of the party is everything, the revolution is only the result of this influence. Loyalty to the party means in the last analysis loyalty to the bureaucracy in control. There can be no control of the workers themselves; nor can there be any real united front of the workers possible because of the competition between the various groups of leaders. The conception of the old labor movement from Kautsky to Lenin, that the workers by themselves will never develop real class-consciousness; that the party is necessary to bring this consciousness to the masses; is a mechanical conception of the role that consciousness plays in the class struggle and has nothing to do with Marx or Marxism. For Marx the revolution of the proletariat is inevitable. It grows out of the social process of the development of the productive powers. The proletariat, a productive power in itself, a class independent of the ideology of any organization, is the materialization of class-consciousness which results from the dialectic movement of society from a lower to a higher form. Even if revolution and consciousness is an interchanging process, revolution is the primary factor. Revolution not ideology is the determining factor. Class-consciousness does not have to be expressed in the party-form; it can also be expressed in other organizational forms. If the party expressed the crystallization of class-consciousness at one time during the historical process it does not follow that this will always be the case. The fact that never in the last twenty years, has the party been the determining factor in any revolutionary situation is an undisputable fact. The Soviets, the committees of action, the workers and soldiers councils were the spontaneous expression of the fighting workers. Revolutionary class-consciousness can be expressed and is expressed in Capitalism as an ideology. But it is more than this; it is also identical with the material struggle of the workers regardless of their ideology. It grows out of the needs and struggles of the workers in action, as the economic and historical process develops. Class consciousness apart from the working-class in action means nothing. In the last stage of the period of capitalistic decline, the ruling class cannot tolerate even the slightest economic disturbance. Their position becomes so precarious that they must suppress the least movement on the part of the workers. They are forced to fight the workers as if they were revolutionists, regardless of how backward may be the ideology of these workers. They thereby force the workers to fight back as if they were fighting for revolutionary goals. Against their will, the ruling class teaches the workers the weapon of Civil War. Capitalism not only produces its own grave-diggers, but it also shows them how to fight capitalism successfully. Fascism will destroy the old labor movement, but will need to build up a new bureaucracy in its place. To hold power, to assure its own existence, the new bureaucracy must suppress the movement of the workers continually. The permanent crisis forces permanent terror, an expression of capitalistic barbarism in its last stage. It may retard the organizing of the workers, but it cannot stop the class struggle. New organizations will grow and vanish, and again new ones will grow in their place. None of them will be permanent or powerful enough to control large portions of the workers. Big, centralized organizations will no longer be possible in a situation of capitalist dictatorship. The political necessity of the ruling class, however, to isolate, to atomize the workers as it were, does not change the economic necessity of having workers in large quantities together in factories, in industries, unemployed centers, civil work projects, etc. Where workers are combined together with common interests, common situations, they will organize in the new form which cannot be controlled or destroyed. They will organize for action and select from their own ranks a leadership. The committees of action are here the only possible leadership in the workers councils,-the Soviets. The leadership of workers, never separate from the fighting workers, under the control of the workers will suffer in case of defeat just as the workers who are defeated. The Soviets, or workers councils, which have been the real organization of workers in all working-class uprisings, becomes in the permanent crisis of capitalism the only possible form of organization. Capitalist suppression brings into being the organization and instruments of struggle. These organizations, in spite of their organizational weakness, will have in their ranks the real revolutionists. Their clarity will mean more in the coming mass actions, than the automatic following of leaders which distinguishes the old labor movement. The self-initiative of the workers will characterize these movements. The Soviets becomes the practice of the working-class, and with this – revolution becomes the question of the day. The revolution, is the work of the proletariat as a class, and the class can only be brought into action above all party and group interests, and can only be successful in this function in the form of Soviets. The Role of the Party. The communist revolutionary party is an instrument of revolution and as such it must serve that purpose. It has no interests separate from the working-class, but is only an expression of the fact that minorities become consciously revolutionary earlier than the broad masses. It uses this advantage only in the interests of the working-class. It does not look for power for itself or for any bureaucracy, but works to strengthen the power of the workers councils, Soviets. It is not interested to hold positions, but to place the power in the hands of workers committees, exercised by the workers themselves. It does not seek to lead the workers, but tells the workers to use their own initiative. It is a propaganda organization for Communism, and shows by example how to fight in action. The communist revolutionary party does not compete with other organizations for members or for control of masses of workers. It seeks no power inside of capitalism, so has no use for parliaments or trade unions; but realizing the reactionary nature of these, must fight all organizations which tend to lead workers away from the real struggle and the revolutionary objective. Because the exploitation of workers in capitalism is only possible because the capitalist class controls the means of production and so also the product, the party will fight not only for the revolution, but to place this control into the hands of the workers. The proletarian revolution for communism must abolish the wage system, and so the party stands for doing away with the wage and capital relationship. The party fights against “state communism” for real communism as it fights the dictatorship of the party for dictatorship of the proletariat. Although the stage is not yet set in the U. S. A. for the final conflict between capitalism and communism, this does not exclude the possibility of a real revolutionary program. The party, because it has no interests separate from the working-class, fights with them in their struggles for existence at all times, always pointing to the final necessity of proletarian revolution. The party engages in the struggles for immediate demands as long as the workers themselves are directly and actually engaged in the struggle. It refuses to do anything for the workers, as no one can do anything for them which they cannot themselves accomplish. The party will participate in the struggle of the unemployed, in strikes, and in all activity which will deepen and sharpen the class struggle, and develop the self-initiative and militancy of the workers. The party under no circumstances engages in any form of parliamentary activity, or deals as a medium between capital and labor in the union field. It is only interested in the fight and struggle of the workers and in the proletarian revolution; to make a business of the labor movement it leaves to its enemies. We, of the working-class, find ourselves in this the death crisis of capitalism, in a situation of continuously worsening conditions, general wide-spread misery, subject to the onslaughts of a ruthless ‘capitalist class, menaced by a vicious world-wide movement of Fascism, betrayed by the reactionary so-called labor leadership, hampered by outworn traditions, and confronted with numerous intensified struggles. It is necessary in this situation, not only to understand the historic process but also to recognize our enemies. Our duty, our historic task lies before us. As the world crisis deepens, the revolutionary situation approaches, wherein must be fought the final conflict against Capitalist barbarism for the dictatorship of the proletariat and for the realization of real communism, – the association of free and equal producers. 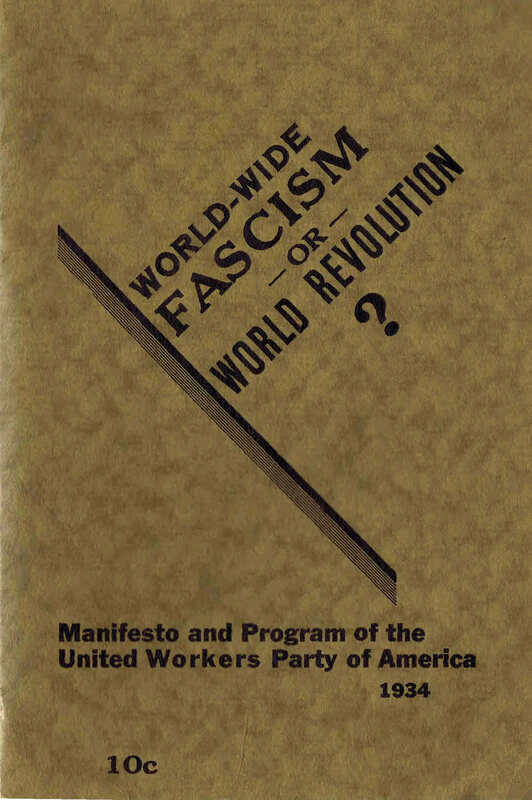 PROGRAM of THE UNITED WORKERS PARTY of AMERICA. The present crisis definitely establishes that Capitalism has passed its zenith and is now in the stages of decline. It will be a permanent crisis as long as the Capitalist order lasts. From now on the Capitalists can only retain their position as ruling class by the general, absolute and continuous pauperization of the working-class. In order to insure this uninterrupted pauperization process, it becomes necessary to discard the democratic political structure and open dictatorship takes its place. World-wide Fascism confronts the working-class, unless they carry through a successful proletarian revolution, establish the dictatorship of the proletariat in the form of Soviets. The old labor movement cannot fulfill this necessity; they have no chance to survive the onslaughts of the ruling-class. They are unable to fulfill the historic task of the Proletariat. The Reformist, the Trade-union, the Bolshevik and the Neo-bolshevik movements, even against their own wishes, will act in the interests of Capitalism. They must be pushed aside to make room for the workers’ Soviets, the fighting organizations of the revolution. In distinction to other parties, who in their anxiety for numerical strength and influence make concessions to the agrarian classes and petite-bourgeoisie, the United Workers’ Party maintains that the only real revolutionary class in society is the proletariat. We fight with the workers in their struggles for immediate demands as long as the workers themselves are engaged in these struggles, always pointing out that the only final solution for the working-class is in the proletarian revolution. We are opposed to all parliamentary and trade-union activity as these activities can accomplish nothing in the period of permanent crisis, but tend to act against the interests of the workers as a class; only the actual struggle of the workers themselves can accomplish any results. Only during the period of collapse of Capitalism is the proletarian revolution historically possible and the only form of organization which can survive and function successfully during this stage is the workers’ councils led by the committees of action. Our theory and practice is a Marxian one, and we consider ourselves the real communist movement of the present and the future. We shall work for unity between groups such as ours in the many countries throughout the world, to bring into being a real revolutionary International on the basis of this program. This entry was posted on 28 janvier 2009 at 16:21 and is filed under Documents historiques, in english, Mattick. You can follow any responses to this entry through the RSS 2.0 feed. Both comments and pings are currently closed.